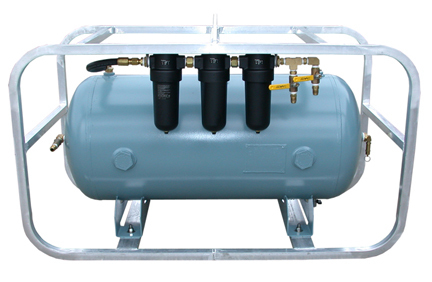 Our Volume Tanks are ASME constructed 200 PSI rated air receivers. They come standard with heavy duty brass plumbing and your choice of filtration or no filtration. 1/2″ check valve on the #10 JIC inlet and 1/2″ ball valves with #10 JIC outlets are standard. They also come with a stainless steel pressure gauge and a brass relief valve. On models with 2 stage filtration systems, there is one 5 Micron 1st stage filter and one Charcoal 2nd stage filter.